Froggys Fog Faze Haze is designed for a wide variety of water based Hazers. A very fine veil of airborne canvas is produced exposing light beams with a moderate refraction rate. Faze Haze is a premium water based haze fluid. It's Formulated to produce a beautiful, translucent canvas of haze with a long hang time. Until you've tried Faze Haze by Froggys Fog, you'd never realize how good your lights could look. It's perfect for any venue or facility, it's 100% odorless, and is designed for Antari F-1, F-5, F-7, Chauvet Professional AMHAZE 2 and Martin Compact Hazers. High Output, Long lasting, Remains clean, dry, and odorless. Designed For Use in Antari Fazers, Chauvet Hazers, Base Hazer Pro and Martin Compact Hazer. Actor's Equity Listed for Use in Antari F5D, Chauvet Amhaze II and Base Hazer Pro. Compatible with Chauvet Hurricane Haze 1D, Haze 2D, Haze 4D. Compatible with Antari F1, F4, F5, F5D, Z-350 and Z-380 Fazers. Compatible with hazebase base hazer pro and Martin Compact Hazer. Ideal for mobile DJ's, Night Clubs, Laser Tag Arenas, and Lighting Enhancement Applications. 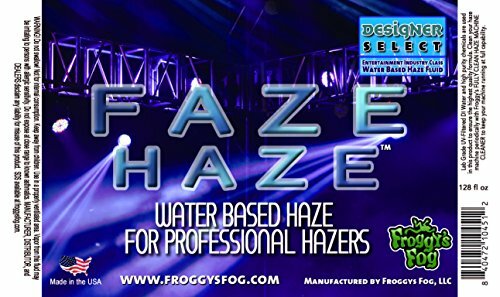 100% American Made - Froggys Fog uses De-Ionized Water and Pharmaceutical Grade Chemicals.